A Hawthorn champion and genuine AFL superstar who was Queensland’s first member of the AFL Hall of Fame. Burst onto the scene as a 17-year-old Coorparoo full forward in 1984 when he topped the QAFL goal-kicking (73 goals), kicked seven goals in the Roos’ grand final win, made a brilliant debut for Queensland, and was snapped up by the Hawks. Played 269 AFL games from 1985-98 and kicked 1254 goals to rank third on the all-time AFL goal-kicking list behind Tony Lockett and Gordon Coventry. 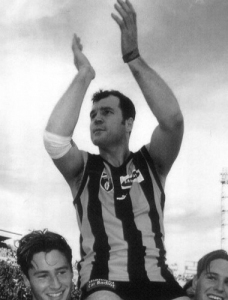 He led the Hawthorn goalkicking 11 years in a row from 1986-96 and again in ’98, topped 100 goals six times, won the Coleman Medal in 1988-89-92 and the Hawks B&F in 1988-89-92-93. Hawthorn captain from 1995-98, he played in four premierships in 1986-88-89-91 and one losing grand final in 1985, plus five AFL night premierships, and won All-Australian selection four times. He kicked 17 goals in one game against Richmond in 1992 to fall one short of the AFL record, and four times finished among the leaders in the Brownlow Medal – equal 2nd in 1988, equal 3rd in 1989 and 1993, and 2nd in 1992. Played 21 finals for 78 finals goals – No.2 on the all-time list. And all that despite a fractured skull in 1990 and knee reconstructions in 1996-97. Represented Victoria at interstate level, played seven times for Queensland, skippering the Maroons in 1992 against NSW in Sydney, and was named vice-captain of the Queensland Team of the Century. Has also sat on the Hawthorn Board of Directors and served as caretaker CEO in 2004, playing a key role in the appointment of coach Alastair Clarkson and formation of a redevelopment plan which culminated in the 2008 AFL premiership.